What a lovely place! This well cared for holiday home is in the centre of a large, Mediterranean garden and in walking distance of the village of Vergèze (300 m). 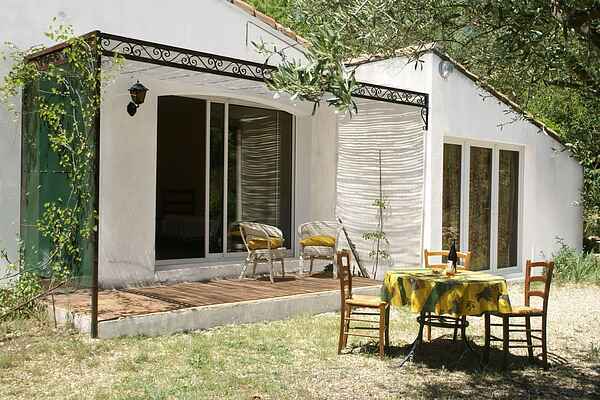 The holiday home is semi-detached to the villa of the very friendly and discrete owners. There is no visual contact with the owners from your private garden. Vergèze is situated between Nîmes (20 km) and Montpellier (41 km) on the foot of the Camargue. You can reach the Mediterranean Sea in half an hour. Go to the seaside resort La Grande Motte (27 km) for some fun on the beach. The medieval city of Aigues-Mortes (23 km) is a cultural landmark, which used to be one of the eight safe places for protestants. Groceries, bakery, tennis and restaurants in Vergèze. 18-Hole golf course at La Grande Motte and at Nîmes (20 km). To take in some culture, make sure to visit the beautiful city of Montpellier with its many points of interest. In the Roman era, the city of Nîmes was an important city, from which its many ruins and an impressive arena are reminders.